I usually bunch all the front row attendees together, but Kristen Stewart needed a post of her own, as there is much to discuss. 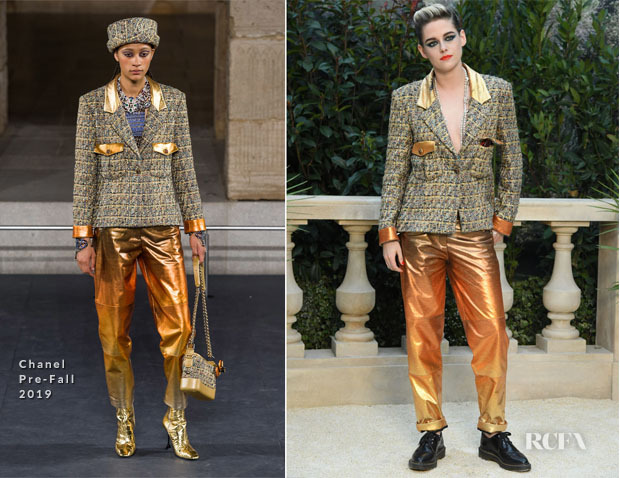 The actress, who has been a Chanel ambassador since 2013, stepped back into the limelight for the Spring 2019 Haute Couture show in Paris this morning (January 22). There was unlikely to be a flowery moment from Kristen – that ship has sailed – so I’m always intrigued to see direction she’s likely to take. On this occasion she had a mannish moment wearing in a look from the Pre-Fall 2019 collection. I want to like this look for boldly working the androgynous elements, but something was throwing me off. At first I thought it was the ombre fire trousers, but on reflection it is the shoes. Gold or orange brogues would’ve been too clown-ish. Heels wouldn’t have worked for the clear direction she was going for, so I’m at a lost. Makeup-wise, I’m in love. She never lets me down in that department.